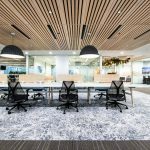 After the successful delivery of Wrays head office in Perth, the IA Melbourne studio was engaged to design and deliver the Wrays Melbourne office. The design aesthetic was to associate with the completed head office in Perth whilst incorporating an essence and feel that is unique to Melbourne. The delivered office space is open and saturated with natural light, designed to allow for future company growth whilst meeting their current requirements. The modern fit-out boasts innovative workspace techniques to efficiently utilise space whilst maintaining a warm, inviting and contemporary atmosphere for both their staff and clients alike.